Make Your Home Welcoming with a New Double Glazed Door. Your front door should make a good impression when people walk up to your home. A new double glazed door can help you transform your home. This kind of door is an investment and it can add value to your house. One of the most common mistakes that homeowners make is placing more emphasis on elegance and beauty and compromising on security when they choose doors for their homes. Double glazed doors are a great solution for any home because they offer both aesthetic appeal and improved security. These types of doors are made of UPVC, a strong and durable material that is also beautiful, allowing you to make your home more welcoming. The double glazed doors are ideal if you want to make it difficult for intruders to gain access to your home. UPVC is sturdier compared to conventional door materials. These are designed to resist impact and this means that they are less likely to break if an intruder tries to kick them in. Most intruders look for an easy way to access your home and doors are usually the first option. This is why it is important to install a door that is made of tough material such as UPVC. Double glazed windows also come with enhanced security features. They have unique locks that are designed to prevent unauthorized entry into your home. Intruders usually pick locks especially when they realize that you have used substandard ones. With this kind of locks you do not have to worry about anybody picking your locks. Make Your Home Welcoming with a New Double Glazed Door. Doors that are double glazed enhance curb appeal. This is because they are made using the latest technology. Make Your Home Welcoming with a New Double Glazed Door. There are various designs to choose from to suit your style. The variety allows you to select a door that matches with your interior and landscaping. Some of the options available include contemporary and modern doors. Another benefit of using the double glazed doors is that they require little maintenance. This is a very important consideration when you want to install a door because it is the focal point when people come to your house. These doors are weather resistant and 100% waterproof. This means that you can use them in various regions and not worry about how the weather will affect them. They are designed to withstand salty air, heavy rains, and strong winds. The double glazed door will not corrode, warp or rot. It is also resistant to insects such as termites that usually destroy wooden doors. You will not have to repaint this door several times a year to keep it looking good. Your double glazed door will remain in good condition for at least 10 years after it is installed. If you want to install a double glazed door, visit us at the Advanced Group to book a free home survey. During the survey you will learn about available door options and the most appropriate one for your home. You do not have to compromise on security because you want a stylish door. 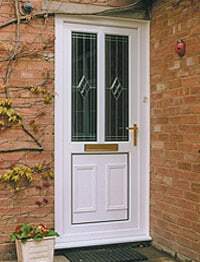 A Double glazed door allows you to have secure and fashionable doors. Make Your Home Welcoming with a New Double Glazed Door. Give us a call at The Advanced Group today on FREEPHONE 0500 338 488 to find out more and to get a FREE consultation with a helpful member of our team. Or Simply complete the enquiry form on this page.